8 Mile explores a week in the lives of a group of young people struggling to find their way in the urban decay of 1995 Detroit. For people like Jimmy 'Rabbit' Smith Jr. (EMINEM) and his friends, hip-hop is the only thing standing between them and the void. Rabbit knows his ticket out is through his rhymes, but to succeed, he has to channel his anger into his lyrics, and face the showdown of his life. From Academy Award winning producer/director Curtis Hanson (L.A. 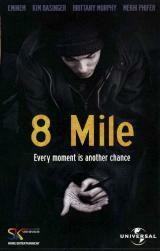 CONFIDENTIAL) and Academy Award winning producer Brian Grazer, ''8 Mile'' is one of the most critically acclaimed movies of the year. Featuring outstanding performances from Eminem, Academy Award winner Kim Bassinger, Brittany Murphy and Mekhi Phifer, the critically acclaimed ''8 Mile'' is one of the most talked about movies of the year.